Maui’s Official Whale Watching Headquarters! 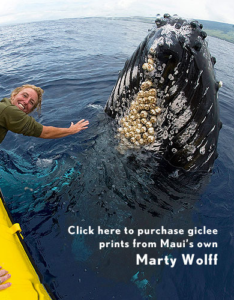 Don’t Miss the Humpbacks While They’re in Maui! There are a number of great certainties in life; the sun will set each night, Old Faithful will continue to blow, the humpback whales will return to Maui every year, and people will come to see them! As cliché as it sounds, it’s absolutely true. Year after year, thousands of whales frequent the Hawaiian Islands to mate and give birth in the warm tropical waters. There’s something so amazing and majestic about watching a 40 ft long, 40 ton whale as it launches itself out of the water, putting on an aerial show for tens of thousands of onlookers every year. The attention that the humpbacks generate actually fuels the local economy of Maui throughout its busiest time of the year. The amount of whale watching trips departing off the coast of Maui has grown substantially over the past decade, just as the humpbacks population has increased. Strict protection laws have led the way for flourishing numbers of whales. As the number of whales increase, so does the desire to see them. It wasn’t long ago that you had only a few choices of trips to take if you wanted to see the show. Now, there’s an extensive variety of boats and trips to choose from. Obviously seeing the whales up close is the best part of any whale watch, but now each whale watching trip has a certain niche that separates one from another. There are whale watching trips to satisfy everyone’s curiosity. You can book a trip on a super fast zodiac, or on a large cruising boat with food, drinks and bathrooms, or you can use the power of wind to sail with the whales; the choices go on and on. We’re going to outline what we consider to be the better whale watching trips on Maui for you. This is a compilation of trip facts and user opinions from both locals and tourists who have taken the time to share their knowledge and experience with YOU!